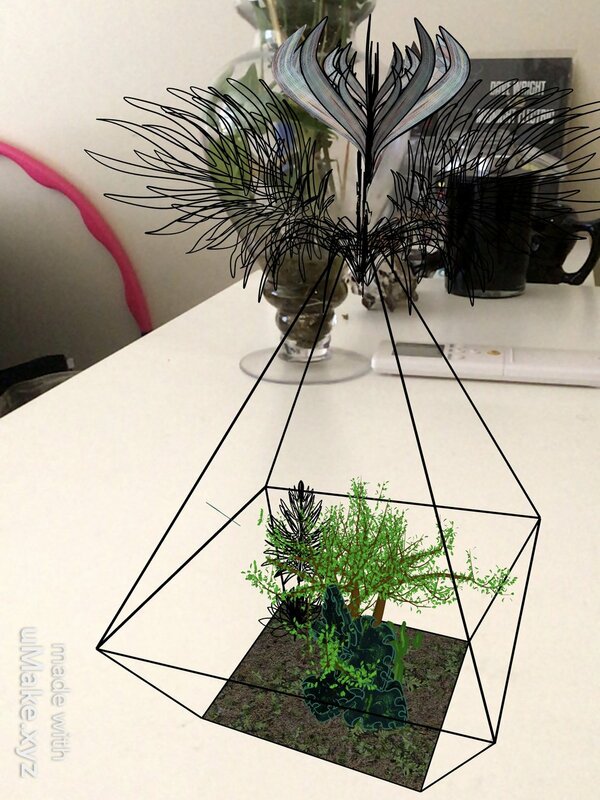 There are a few augmented reality Apps out there, but navigating something thatâ€™s intuitive from a creative perspective leaves much to be desired. You may have heard of Googleâ€™s TILT brush that letâ€™s you paint and draw in 3D, or seen that the majority of whatâ€™s available on the App store is aimed towards guys who want to play golf in their office. I did I little research on artists that had experience with this as a medium and found a Forbes article about the work of Nancy Baker Cahill and her 4th wall app http://www.4thwallapp.org/ which is great because it brings her work to right to you and your environment. This is the end result, so far.. Admittedly, thereâ€™s some errors to be fixed and Iâ€™ve spent some time recently trying to refine and better define the more organic, fluid shapes that I want to use. Just working out how to construct one singular leaf or petal is quite a challenge but Iâ€™m making some progress and will post up when Iâ€™m at a place where I know I can diversify the results. Iâ€™m also working out how to export the finished result so that you can have a look for yourself in real time! In the mean time here is where Iâ€™m currently at with the lotus flower Iâ€™m working on. Scale, position and rotation can all be modified for the space in which you want to see the Terrarium which is great for having a closer look at the rendering on plants. Iâ€™m enthusiastic about the potential for Augmented Reality in teaching with scientific diagrams. This is really my goal. Being able to see inside of a Pollen grain by blowing it up to the size of your lounge, or understanding various systems in a living body or a planet on your lunch break in the park, anything really. Beyond just staring at the screen while you mess with your posture you can walk around it and interact with from any angle. Here is another progress clip from my next project. Iâ€™m building a Lotus flower from scratch. This is the closed position. All posts are my own and I do not have any sponsorship or affiliation with uMake. I've used my collected ferns in paintings and collages so with the leather pouches and cuffs I was making it just made sense to try making an accessory that was transparent while running along the same ferny dialogue I've been using for years with the 3D works like Terrariums and video work.